Served in Canadian Navy during WW II. Died young (47) of a sudden heart attack. Brewers Warehouse dispatcher, Scout Leader (Baloo) Served in Canadian Army during WW II (cook in officer's mess, Hamilton ON). Remarried Clint 30 years after the death of James. Served in Canadian Airforce during WW II flying the giant airboats on submarine patrol out of Ireland. An engineer for Ontario Hydro. Raised by his mother as a single parent after his father was lost at sea, he rose to become a foreman in the Tube works and a good parent to his children despite loosing his wife when he was only 37. Weaver in a Cotton Mill. Died in Childbirth at 35 years of age. Had a sister Mary Robertson who signed as a witness at her wedding. Daughter of William Robertson (a coal miner) and Annie Steel. Annie Steel Robertson raised her daughter Elizabeth's two surviving children after Elizabeth's death following a miscarriage. A coal miner born in Larkhall, Lanarkshire, Scotland. He lost 2 sons in WW 1: Frank Muir, an Able Seaman was killed on Monday November 13, 1916; Louis Mccutcheon Muir, Private 8th Bn. Gordon Highlanders, died Saturday October 9, 1915 born at Larkhall, Lanarkshire. By the time he died the Muirs were living at Armstrong Cottage, Grange St., Motherwell . A third son, Hugh Muir was captured by the Japanese on on the Island of Nauru in 1940 and may have died a prisoner of war. A tailor in Scotland. Born in Dalserf. Daughter of John McCutcheon (1832 son of Eccles McCutcheon & Jane Kerr) and Elizabeth Wyper (1838 daughter of John Wyper & Mary Maxwell). Sister to Lewis (11/30/1858), John (8/17/1860), Janie (2/1/1866), Jean (1/10/1868) & Hugh (3/14/1870). Married John on 11/2/1888. Died in Toronto, buried beside her daughter Elizabeth Muir Lindsay and son-in-law David Lindsay at Pine Hills. A Coal Miner. Had an older brother James (1842), and a sister Mary (1844). Orphaned he was raised by his maternal uncle and aunt Benjamen and Esther Hutchinson in Old Monkhead Parish. Left the mines to become a mariner sometime between 1871 and 1881. Never returned to his family and may have been lost at sea. Both his actions and his fate are a considerable mystery. Married Isabella Finnie in Airdrie 12/30/1870. Parents were Samuel Finnie, a coal miner, and Stewart Gardner (b 8/15/1818 in New Monkland, d 5/31881) of Airdire. After the death of Samuel, Stewart married Alexander Black in 8/1852. Stewart's parents were William Gardner and Elizabeth Moffat (who had ten children including Stewart). In turn, Elizabeth's parents were Alexander Moffat and Helen Stewart. It was in honour of Helen that the name "Stewart" enters the family as a woman's forename. A Steam Loom Weaver. Suffered from "general paralysis" for four years prior to her death at age 41. Born 1838 in Nitshill, Renfrewshire. Died of "Miners Phthisis, a form of tuberculosis, 21/10/1873 Born 1842. Worked as a tambourer, embriodering muslin cloth. A coalminer. Married Margaret 11/17/1862 in Millheugh, Larkhall. A farm servant. Daughter of John Wilson (mine foreman) & Margaret Dyat (married 11/28/1830 in Hamilton). Also the mother of Robert (2/9/1868),Margaret (b. 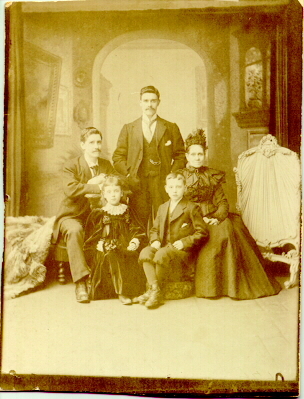 3/20/1870 married Wiliam Provan), Janet (3/18/1872) & James (4/29/1874). A farmer forced out of Ireland by the Potato famine. Worked in the Coal mines of Scotland in the Balquhatstone Colliery, among others. Her father was John Howe, a farmer from County Tyrone.